The adventures in Umbria continue, with a new featured player experiencing the rustic countryside for the first time. My best friend Cal arrived just about two weeks ago and, after a quick acclimation in Rome to Italian time (both the time zone and also the way hours work a bit slower here), we took the scenic train ride away from the city and toward Umbria, the green heart of Italy. Cal and I went to college together, are rock climbing partners, artistic collaborators, lived together this past year in Los Angeles and, perhaps most of all, share a similar ethic around the joys of preparing food with and for those we love. What better place to delve into this passion than in Umbria? We settled into our routine of adventure with immediacy and great delight, reveling in our early morning exercise, followed by a long and slow breakfast preparation with the eggs from our lovely birds and produce from the orto at the farmhouse. We take turns brewing coffee in the moka pot – one as we start to cook and a second batch just as we sit down to eat, making sure to steam our milk only if the clock still reads before 11am. The food scraps from the morning meal get walked over to the birds as an extra treat, then we linger at an outside table to work on the day’s crossword. As usual, any number of thoughtfully planned or curious and improvised adventures await us. A black truffle. The official fungus of Umbria. In these two weeks, Cal has ascended the ranks (i.e., supplanted me) in the kitchen at le Delizie del Borgo, our friend Simone’s restaurant in nearby Bevagna, effectively serving as sous chef and doing a damn fine job: a guest sent explicit compliments back to the chef for the Umbrian classic uovo morbido, the elevated Italian brother to our scrambled eggs – not knowing it was l’americano Cal who had executed the dish flawlessly on his first attempt! Meanwhile, I’ve ventured into the server’s world which has proved a highly encouraging environment to hone my Italian and let out my inner sprezzatura, a necessary nonchalance that all waiters in Italy are seemingly dripping with. Outside of Simone’s kitchen, we have been spending heaps of time in … our kitchen. At the farmhouse, every meal can be envisioned just by stepping out into the backyard. We’ve strung together all manner of immediately fresh, holistically healthy (if you consider using a lot of olive oil healthy), unreasonably tasty meals in a setting that Cal has been describing as “magical” – when he has the words the express the feeling. On our day off last week we took the bike path from Cannara to Montefalco which, given the fact that we got slightly lost, ended up taking about two hours. After having scaled some serious hills, we luxuriated in the beautiful square, walked the entire circumference of the town, sat and had coffee and some time to draw, and ran into just about every person I know with even a loose connection to Montefalco along with making some new friends at some of the local businesses. Among these happenstance visits were assorted members of the Pardi family, all of whom had eagerly been awaiting the arrival of Cal to set into motion an opportunity for us to all spend time together. We made the obligatory stop at the family winery to say hello to Albertino, the man who runs the business, and we unexpectedly left with plans for him drive a 60 gallon stainless steel fermentation tank over to the farmhouse to assist in a batch of beer we will be brewing in October, as well as talk of him contributing an oak barrel as well to age our sure-to-be spectacular beer. Speaking of beer, the hops that I planted last year in hopes of convincing a local winemaker to help me make a beer here (thanks Albertino!) have just been harvested! The hops are now dried, vacuum sealed, and keeping fresh in the fridge, along with some green Italian figs (known as both dotato or kadota figs) being stored in the freezer that will be added to the beer after it finishes its first fermentation. Instead of buying yeast, we are going to collect a sample of local ambient yeast from the rich biodiversity of our garden at la Fattoria del Gelso, and we will use local barley and other grains as the base. After running the brewing club at my college (yes, I know, pretty sweet) and working in a brewery right after school, this situation is what I would consider the ideal. More news on that to come with the arrival of my brewing partner from college and tour guide of one of the best sour beer breweries in the US next month! This makes me very hoppy. Not to miss out on the climbing while we’re in Italy, Cal and I managed to find one of the most unexpected experiences one could imagine. In the town of Serra San Quirico about two hours away, there is a yearly climbing festival that takes rope climbers onto the high cliff walls that surround the town. However, the locals also curate much shorter routes throughout the medieval architecture of the town, climbing on the old tower, in a brick archway tunnel from maybe the 1300s, or up the face of the town fortress wall to a window that was once used to shoot arrows at approaching enemies. We spent the day touring this unbelievable historic town while also climbing all over it. For many climbers, there is a challenging balance between spending time in the city and getting to climb outdoors – we got both at the same time! We spent another day harvesting grapes, this time for our friends the Pardis. Seemingly, the crew didn’t account for what naturals Cal and I would be because all together we finished a supposedly 5 hour job in just under 3 hours. Thanks to a very early start, this left us with pretty much a whole day ahead and no real plans. With time to kill, one of our fellow harvesters, a friend of Albertino’s named Kwan, whom I had met last year at a lunch party in the winery offered to give us a ride to his parents’ property just on the outskirts of town. Although it was only a few minutes away, the ride transported us to a different place. We arrived to the gates of a reasonably sizable but very humble property and were greeted by a horde of dogs. Looking to the right, there were three comically obese Thai pigs that were very sweet and devoured whole apples with their hairy snouts. Out from the garden ambled an older man with a pronounced back hunch, leathered and weathered fingers, jet black heavy eyebrows and a frayed baseball hat with the bill torn off to fit as a skull cap. He looked like the idyllic Italian garden in late summer, in fact, much like the one from which he was just exiting. We proceeded to be inundated with generosity, sharing thoughtful and slow conversation across three languages, being taught how to crack a walnut with one hand (as evidenced by Kwan’s older father being much more capable than us two strapping young climbers, strength is not so much a matter in the equation as finesse), sampling and eventually being sent home with a bag of the best figs either Cal or I has ever tasted, and convening with all sorts of animals besides the pigs. Kwan’s father, it seems, spends every waking hour tending to one aspect of another of his farm, which includes the aforementioned pigs, figs, and walnuts, as well as a vibrant and active orto for produce, about two dozen goats, 100 or more birds, including turkeys, geese, ducks, and chickens of varieties I never knew existed, and three donkeys. Sharing that space, that time, and that company was a true lesson to me in the ethic of sharing – it was the kind of experience that keeps your breath stuck somewhere between your lungs and your mouth, a distinctive warmth that has your sensations fully tingling but your mind at complete ease and drawing out every moment. It really was hard to leave, but sure enough, we ended up back there the next day. Farm living is the life for me . . . It has been just a week since Suzy and I returned from our annual spring pilgrimage to Italy and we’re already counting the days until our return. The two and a half week trip flew by and is now a just a memory. But oh, what memories! Our April visits are always a joy, if only because they give us the opportunity to enjoy springtime in Italy, which really is, in a word . . . magical. This year was no exception, with perfect weather during our week in Umbria and even perfecter weather throughout the week we traveled up north. Pavilion for the Veneto region at VinItaly. This is a building, not a landscape! 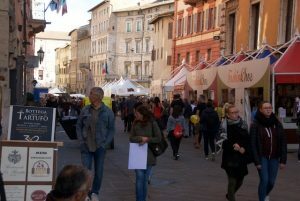 That second week’s itinerary took us to Verona, site of the VinItaly, the Italian wine expo that is held annually there. This was Suzy and my fifth visit to VinItaly and even after all those visits, it remains simply breathtaking in its scope. 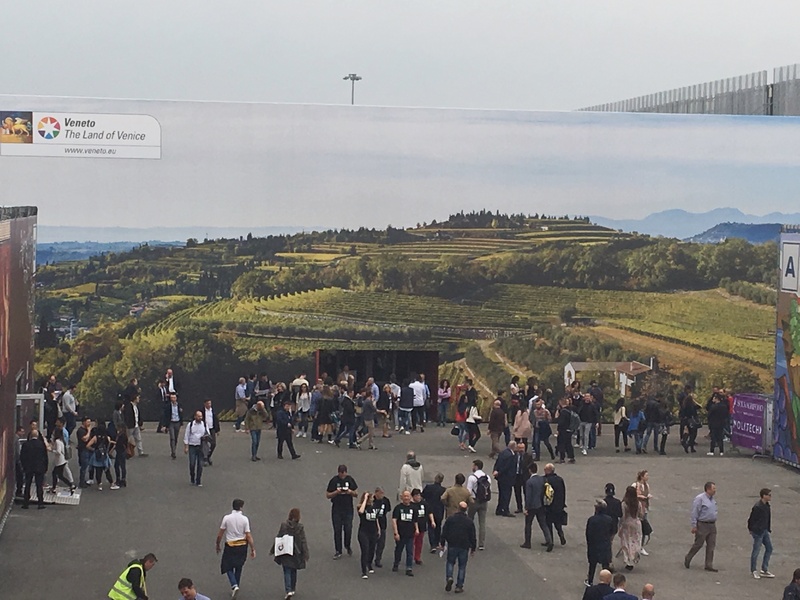 Nearly five thousand exhibitors displaying tens of thousands of Italian wines in a dozen airplane hangar-like pavilions covering a million square feet. That’s an awful lot of wine for two people to drink. Our new best friend. Also pictured, Marta Poli, the export manager at Mirabella winery. That’s why we brought Lindsey and Scott from Via Umbria to join us and help us navigate this ocean of wine. For four days we spread out and made new discoveries and friendships and renewed old ones. 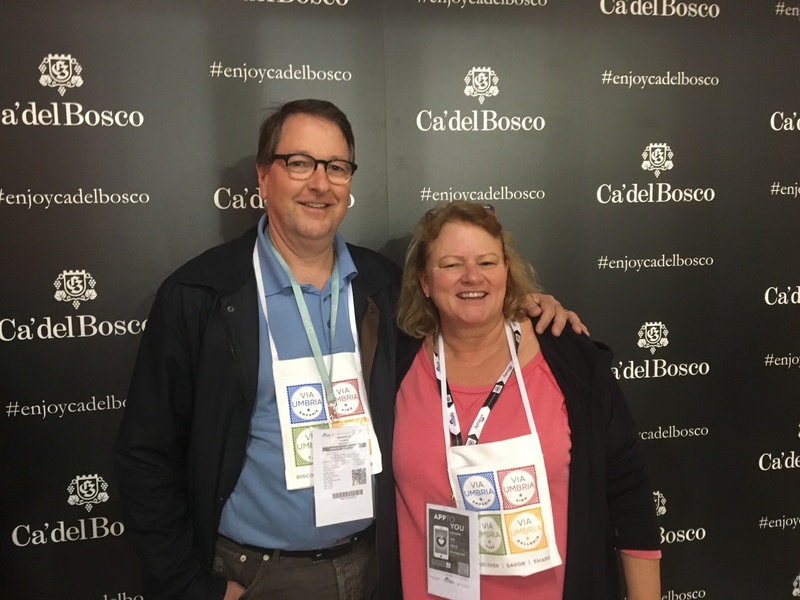 We drank bubbles – lots of bubbles – from spumante to prosecco to franciacorta. We drank white wines. We drank red wines. We learned about particular grapes, about soil, about terroir, about traditions. We met winemakers and met their sons and daughters, their mothers and fathers. We saw our friends and neighbors from Umbria and made new friends in Piemonte, Lombardia, Veneto and Puglia. For us, wine tastes better, leaves a deeper impression and is just plain more enjoyable when we don’t just taste it, but understand it. Not a clinical academic understanding, but an appreciation and a showing of respect that comes from knowing the grapes (of which there are thousands in Italy), of knowing where it comes from (the zone, the soil, the history and traditions of the area) and of getting a sense of the mindboggling number of decisions the winemaker makes every day that impact the final result. 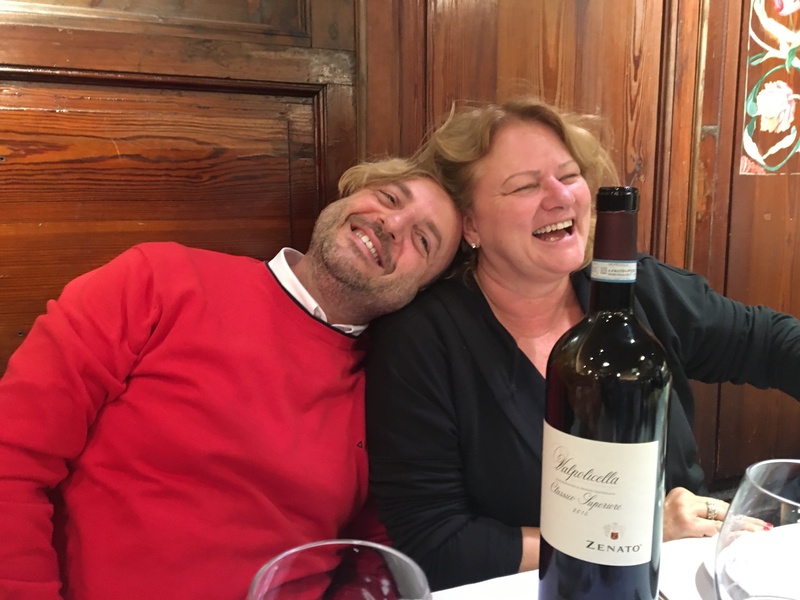 As big and crowded and frenetic as Verona is during VinItaly, it is still possible to find quiet moments with winemakers where they can share their passion with you and help you understand their wines. And along the way you may drink a glass or two. We had a number of those moments with winemakers over our days in Verona. 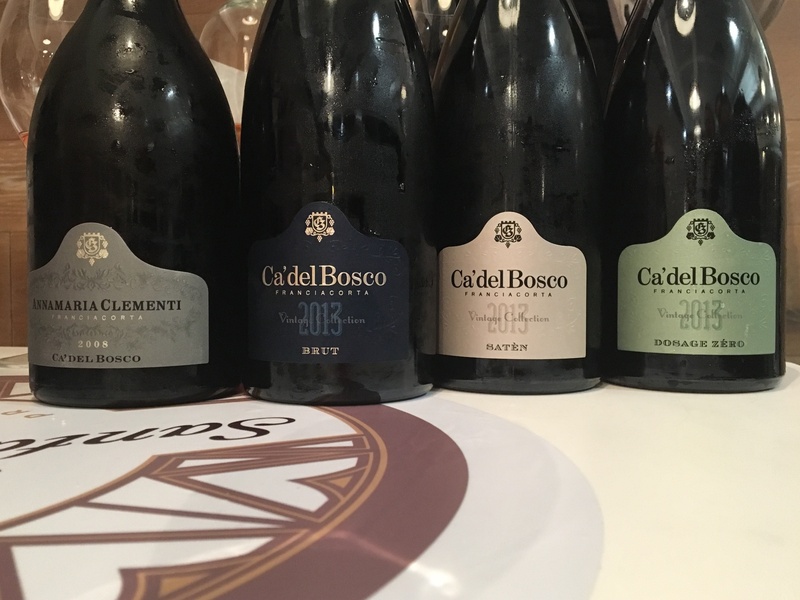 We drank through Giorgio Colutta’s entire lineup while comparing notes with him and his winemaker about the winemaker dinner he is hosting at Via Umbria on June 7. 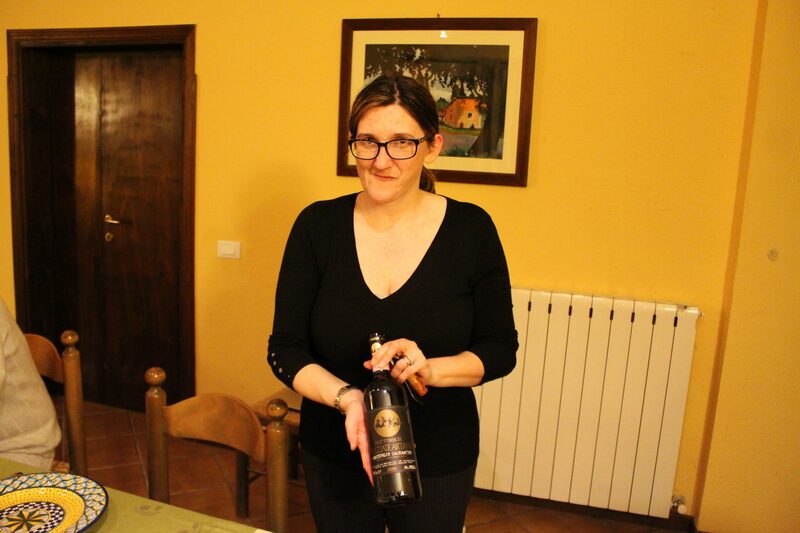 We met Marianna Annio from Pietraventosa in Puglia, who is also hosting a winemaker dinner here (on May 4) and made some last minute changes to the menu for her dinner. 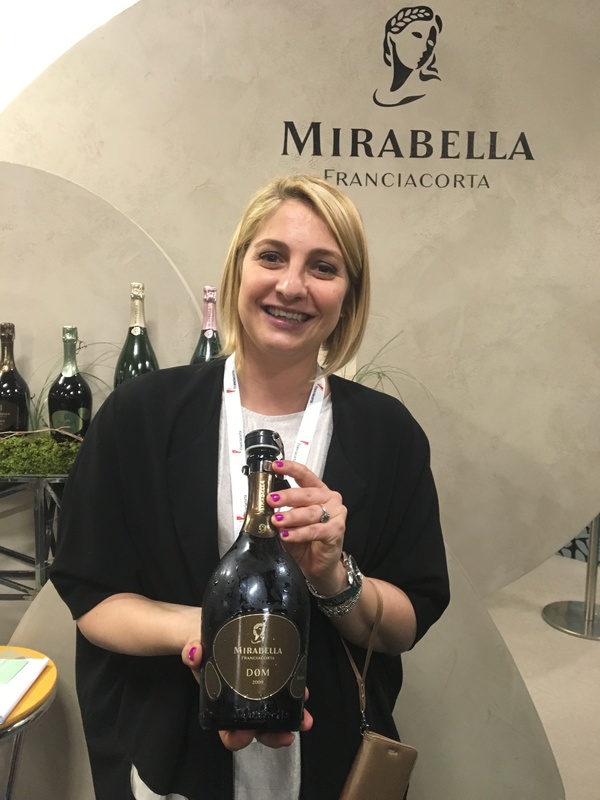 We were given VIP treatment by Cristina Renda, brand ambassador for Ca’ del Bosco, one of the leading producers of Franciacorta, which some call Italian champagne. Cristina prefers to call champagne French Franciacorta. And while visiting Cristina’s private VIP room we ate prociutto and drank bubbles with the owner of the parent company. We tracked down Valentina Frignani, who will be hosting our Veneto winemaker dinner (May 22) and wrangled an invite into her boss’ private tasting room, where we got to meet the boss – Remo Farina – himself. We tasted out of this world Barolo from a small family-operated estate as the owner, Giorgio Viberti, passes on leadership of his winery to his young sons. And on a daytrip outside Verona for another tasting event we were treated to a spirited debate over the relative merits of Tuscany and Umbria by Simone Santini (Tenuta di Calcinaie in Tuscany) and our dear friend Albertino Pardi (Cantina Fratelli Pardi of Umbria). This is how to learn about wine. This is how to taste wine. This is how to enjoy wine. With all your senses and your mind and spirit engaged. Learning from the people who make it because they are all to happy to share their stories with you. And this is what we’re trying to bring to Via Umbria. Interesting wines that are expertly made and enjoyable to drink. Add to that the opportunity to learn a little more about them and great food to eat with them. Our upcoming calendar is full of these extraordinary opportunities. We hope you’ll join us at one of our upcoming winemaker dinners, four and five course menus that were designed to highlight and showcase the wines of these outstanding winemakers. You’ll eat well, drink well, make friends with the winemakers and taste and understand what these wines are and why these wines are. Who knew learing could be so much fun! Terre Margaritelli manager Federico Bibi and Suzy execute a Vulcan Hair Meld. This is the story of four men. Farmers. Winemakers. Community builders. Umbrians. This is the story of Roberto DiFilippo, Federico Bibi, Giampaolo Tabarrini and Albertino Pardi. Umbrian winemakers, colleagues and friends. But we could have just as easily told this story with different names – Roberto Dionigi, Duccio Pompili, Peter Heilbron or a host of others. The love of the land, of the region’s traditions, of the wine that Umbria’s winemakers make is universal amongst them. To them, it is simply what they do. To us it is unique. To us it is inspiring. Over the course of this weeklong food and wine tour our winemaker friends have shared their passions, their stories, their love of what they do. Each one practices their craft differently but at the end of the day, they do it all the same because each in his own way has discovered the universality that connects what they do. Some are organic. Some are biodynamic. Others practice traditional farming methods. But regardless of the label we apply or the strictness of the practices they follow they all value sustainability. Above all they seek to sustain the patrimony that is their land. To nurture it, to make it healthier every day. So they can grow the best grapes. So they can pass on this patrimony to their children and their children’s children. Each respects others’ differences, but they all share the same universal belief. Each looked us in the eye and said that good wine is made in the fields, not in the cantina. That in order to make good wine you must grow good grapes. Healthy grapes that reflect the soil in which they grow. One of them told us of an experience he had in Turkey, where a certain winemaker extolled his practice of adding this and that in the cantina to make up for grapes that spent days in the sun before fermenting. This, our friend opined, perhaps a bit too generously, is just a different approach. The wine, he told us, was “technically good.” It had been corrected in the winery. Our winemakers prefer not to correct mistakes in the winery. Because you can make bad grapes “technically good.” But the excitement in wine is not in being technically correct, the excitement is in feeling something alive in your mouth. Something that vibrates with the rhythms of the fields and the sun from where it came. You can correct flaws and make something “technically good” but you can’t give it life. You can’t give it personality. Only the land and the sun can do that. And that is what these four men have spent their lives learning. Their wines are simple in the very best sense of the word. They are made from healthy grapes grown in well-tended fields. They are transformed from juice to wine with knowledge and experience that does not rush, that does not cut corners. Because while technology can minimize risks and defects, only time can produce great wine. This week we have enjoyed many wines at many good meals and have created many pleasant memories around the table. But the lessons of these humble, passionate, patient, giving and caring winemakers – farmers, community builders, Umbrians – will stay with us long after that glorious taste has faded away. And it will leave a taste as sweet and as satisfying as the wine itself. What a fierce winter this has been. The extremes between odd 60 degree days have not been enough to balance the fierce cold, snow and winds that have crept along the east coast. We often joke about how frequently we shut down the government for the promise of snow—this year was an all time first for me when we shut down for the promise of wind. We departed a snow covered New York City for Umbria where we have been greeted by sunny skies and fields of green. We are often asked, “What is the best time to visit Italy?” Of course our answer is always, “Whenever you can make it to Italy.” There is always a good reason to visit Italy. For me, the best reason to visit Italy in the spring is the promise of what is to come. When we visit during the summer—the farmers discuss the heat and the wind—how they are affecting the fields. When we visit during the fall—the farmers discuss the impact of the flies and the rains. When we visit during the spring the farmers discuss the possibilities of what is to come. The promise of a perfect harvest. The potential of a particular grape. The buds on the trees. The gentle rain that just passed through. In spring—everything is possible. Our tours always involve food and wine—in the spring we are drinking the most recent releases. We are eating wild asparagus, artichokes and favas. As our friend Emiliano pointed out to us on day one, “The green has returned”—and we are here to enjoy it. powerhouse to a center of the renaissance. And today it is so much more than a museum, it is a living breathing city, one that happens to be breathing cool, crisp autumn air with hints of chocolate. For Perugia is the home of Perugina, a historic chocolate company where we will be making chocolates later in the day. And Perugia is host of the annual Eurochocolate festival, which we enjoy after our tour has ended. Sandwiched in between Perugia and Perugina is our visit to our friend Federico’s winery, Terre Margaritelli in nearby Torgiano. And as wonderful as is the tour of the winery, where we learn of this year’s troubles with a super hot, dry summer that caused the harvest to be advanced by several weeks, as well as Terre Margaritelli’s commitment to organic, sustainable farming, the highlight of the day is lunch in the winery prepared by Federico’s wife Jennifer. 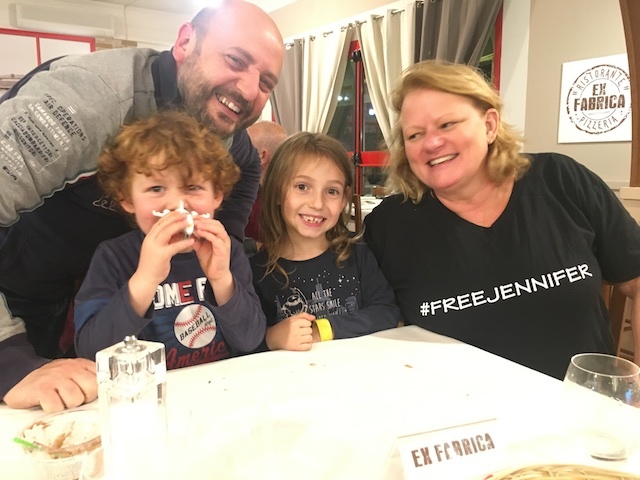 For anyone who doesn’t know the background – Jennifer, Federico and their two children flew to the states last December before Christmas for a work vacation. 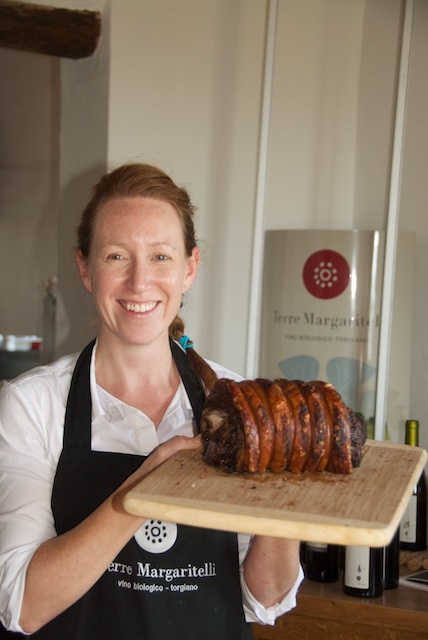 Plans included catching up with family and friends in the states, promoting Federico’s wines and olive oil and for Jennifer to showcase her talent in Via Umbria’s kitchen, followed by a well deserved 10 days in the Caribbean. For all of our Umbrian friends – cooking at Via Umbria is easy, its natural. Where many American chefs see a small, impossible kitchen to cook in – our Italian Chefs see an open space where they can create anything. Unfortunately while we are away enjoying that Caribbean vacation our Chef has decided that ours is not the right kitchen and gives her notice. So – after 10 beautiful days in the sun, as the Bibi family is packing their bags to return to Italy I invite Jennifer out for drinks and ask the impossible. “Any chance you can come back to DC and cook for us for a couple of weeks while we find a Chef?” My powers of pursuasion must be good, or maybe Jennifer is just a good friend, but in any case she agrees to help out and we scramble to rearrange plans, call, beg and plead to find a space in school for the children, and two days later we are back in Washington with Jennifer at the helm of Via Umbria’s kitchen. Days turn into weeks, weeks turn into a month, a month turns into months. Every week we change the return on the ticket. Facebook posts starts appearing (probably written by Federico) – Free Jennifer! Free Jennifer! T-shirts are made for the entire staff. 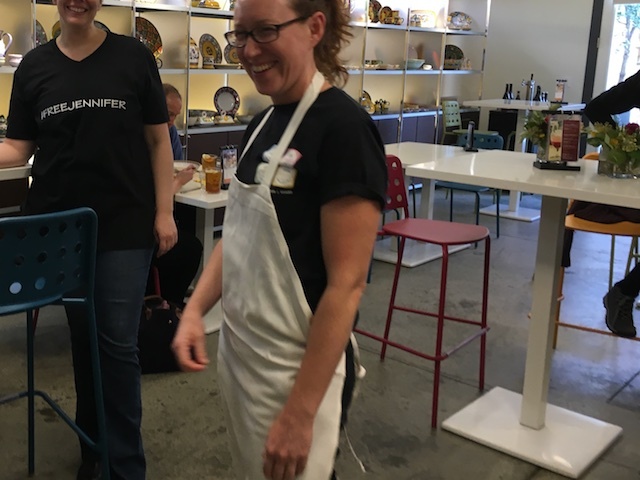 And finally we find Chef Liam, someone we can trust to manage the kitchen at Via Umbria and Jennifer is finally paroled, returning after three months to Italy to her family. Today’s lunch is our chance to see Jennifer back in her element. In the world she has created for herself in Umbria. We sit back and relax. Enjoying a meal – created in a tiny kitchen no bigger than the one at Via Umbria – that captures our favorite Umbrian flavors and experiences. All of this is washed down with a parade of Federico’s wines, making our afternoon in Torgiano not only relaxing but delicious. We may miss Jennifer back in Washington, but on a magic day here in Italy, we’re glad we freed her to come back to her new native land. Today we met Pippo – a truffle dog who has served his master well the last 13 years. He was a champion white truffle hunter but is getting a bit white himself around the snout and beginning to slow down. Not quite ready to retire, his owner has farmed him out as a black truffle hunter, a challenging job but not quite as physically exhausting as hunting the rarer white truffle. Pippo makes a great black truffle hunter. For Pippo hunting for truffles is an adventure, a job you can see that he enjoys. Its pretty simple, go for a walk with your master. Keep your nose to the ground constantly sniffing, searching for the scent of a truffle that is released when the truffle is ripe. Dig up the ground – gently but diligently. Dig deep until you find the truffle and then wait patiently for your reward – not the truffle but a treat from your master. For Pippo the truffle the hunt is a game. In hunting for truffles the hunter is important but the dog is key. Without the dog you simply cannot find truffles. Truffles grow underground and while they sometimes leave clues as to their whereabouts above ground, they can’t reliably be spotted. Although they’re called tubers, they aren’t like a potato where you can see the plant above them. Truffles truly have to be sniffed out. Which is where Pippo comes in. 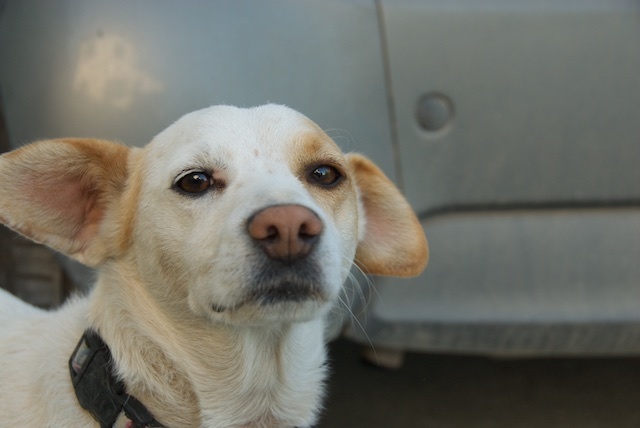 Returning to the home of our hosts for the day, the Bianconis, we meet their other dog – Eddie. Eddie is a high energy dog who as a puppy was always getting into trouble. A loveable naughty dog with needle-like teeth and a disposition to nip. How many times in a day can you say “Eddie, No.” Watching Eddie while enjoying our truffle feast, Gavin, sitting next to me points out that Eddie is having all of the fun while Pippo got to do all the work. While work is fun for Pippo it still is work. He has been working his entire life and is now one step away from retiring. He gets well taken care of and he gets to eat, or at least smell truffles everyday. He is one happy dog. Eddie has never worked a day in his life. He could have been trained as a truffle dog – but he wasn’t focused and pretty much not interested. His reward? He gets well taken care of and gets to eats truffles every day. He is one happy dog. We had a very succesful day today – we found about €600 worth of black truffles. Or should we say Pippo found about €600 worth of truffles and we sat back and enjoyed them. The highlight of Day 1, on which eight of our group, including Suzy and me arrived in country, had to be the carriage ride with Roberto. 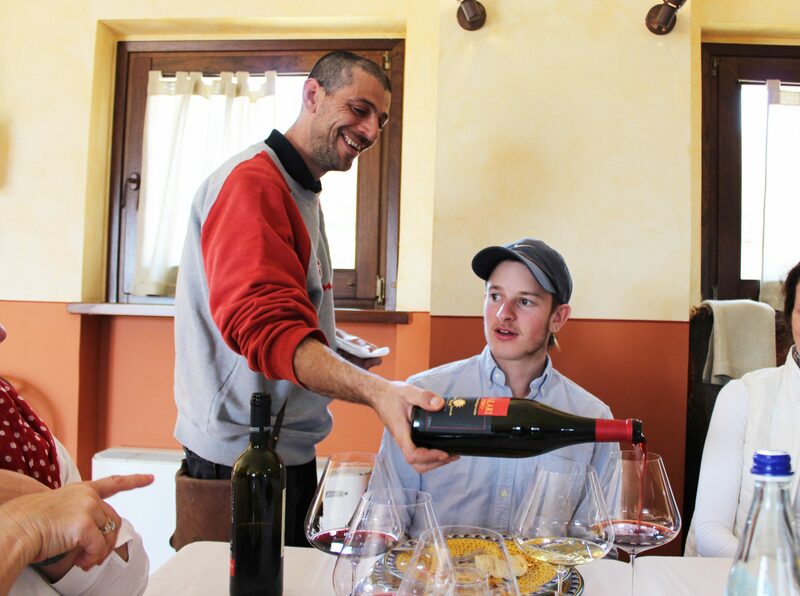 It’s not easy picking just one favorite on a day that included lunch in Santa Maria degli Angeli, a walking tour of Assisi, a visit and winetasting at Roberto’s winery and a marathon welcome meal prepared by Chiara. But when you get to spend a half hour with Roberto DiFilippo, the inspirational owner of DiFilippo and Plani Arche wineries, being transported in a carriage drawn by the horses that work his fields, listening to his philosophy of organic and biodynamic farming while you clip clop through rolling fields that are home to his vines, licked by the cool, crisp, late afternoon autumn air, how could that not be the highlight? 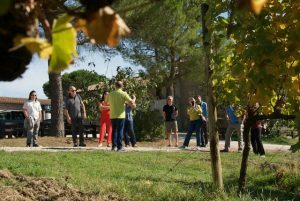 It’s that sort of experience, making the acquaintance of one of the area’s top winemakers and immediately boarding his ten person carriage, entering his world at his invitation, becoming his guest and his friend, that makes these food and wine tours so special. 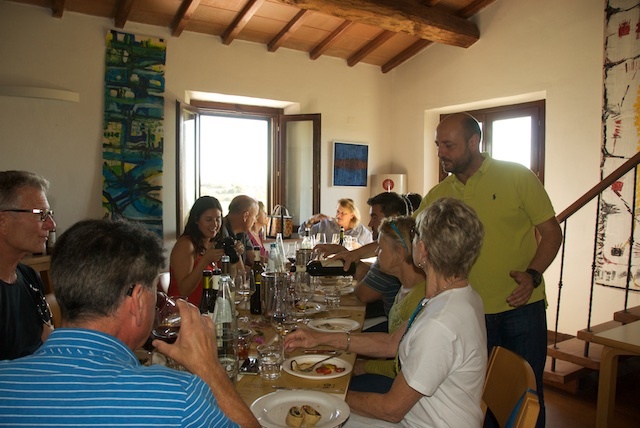 Half an hour later, our group of eight guests find themselves sitting in Roberto’s tasting room enjoying his wine as he and his colleague Valeria introduce them to grechetto, trebbiano spoletino, sangiovese and sagrantino, not to mention Roberto’s special Vernaccia di Cannara. Some of the couples on this tour arrived in our little corner of heaven knowing one another, but by the end of that first day, a day on which all shared and experienced so much together, everyone – those who had already been friends and those that became friends today – had become part of the same family. And so it goes here in the tiny village of Cannara, where Suzy and I have brought part of our family, our oldest son Austin to help manage the group, that we bid a late goodnight, bellies filled and souls sated, to our new family with whom we will share much this week. I love a surprise as much as anyone (especially if its diamonds) but sometimes the best part of something is the anticipation. For our Fall Harvest tour in Umbria I love the planning, the packing, the reading and rereading of the itinerary. Imagining the sights, sounds and smells we will be enjoying. Anticipating the highs and the lows. Preparing for all types of weather – does packing an umbrella really give you a better chance of clear skies? Better not take the risk – throw it in. Talk about anticipation – we have been talking with this week’s group for 4 years trying to get a date on the calendar for their Fall Food & Wine Tour. Bill and I have been working around the clock with Marco and Chiara putting together a week that captures all of our fall favorites. We work with each other to create a schedule that gives a full day with a little bit of flexibility to find new adventures along the way. Our challenge isn’t what to do – it’s how to do everything. So many people to meet, foods to eat and wines to discover. This week is a reunion for us. Catching up with Italian friends who are now part of our family. Sharing stories of weeks past and planning for more adventures ahead. Every stop this week includes friends who have shared experiences with us right here but also outside of their hometown, outside of Italy. So stay tuned for new stories with old friends. And stay right here ’cause these are the good old days. I was fortunate to be born to two amazing people. My parents raised all of us to be confident that we could do anything and to always feel comfortable speaking up. We enjoyed dinner together every night with lively discussions around the table. As children we were meant to be seen and heard. My parents were leaders in all they did and they passed on a strong sense of family and community to all of us. My mother came from a large family – I have 41 first cousins on her side. Whether it meant babysitting for my younger cousins for free or having family live with us in hard times – we took care of each other. We always had room for everyone My mother would throw huge elaborate parties for business and for us kids. We loved hearing a knock on the door signalling that someone was driving by and wanted to drop in. We never ran out of food at the table or space for someone who needed to crash. Sometimes as an adult it is tough staying friends with my relatives on Facebook – but the memories of playing football and cards together balances out their crazy political positions. My father was the youngest state senator ever elected to office in Iowa and went on to hold many political positions and ran for Governor in the ‘70’s. We knew from a young age that our behavior would reflect on our parents. It was not an option for us to misbehave or get into trouble. So minor infractions like being 5 minutes late on curfew or neglecting to unload the dishwasher were the biggest trouble we got into (boy were my folks lucky). As Iowans we were used to seeing all of the presidential candidates around town – as Worthington’s we were used to seeing all the Democratic candidates around our kitchen table. Dad was pretty influential and it was important to get his early support. So while other kids would be playing video games (like Pong) I was knocking on doors collecting peanuts for Carter. We continued to work in politics and made many friends over our wins and losses. Today it is strange to see friends we knew in their 20’s & 30’s become Top Level Advisors and Party Leaders. After much thought we decided to start a family in Washington – we were both hooked on the city. Austin was born the summer after our big Dukakis loss (again – at least something good came out of that election!) We decided to take a break from politics – Bill started at Georgetown Law and I decided to stay home with Austin. I have always felt fortunate that I had the choice of working outside of the home or staying home. I was one happy housewife. Lindsey was born just shy of Austin’s second birthday. We had two great kids, Bill was working at a big firm downtown, we were making new friends in our neighborhood. Life was Good. Why not make it better – we had always talked about having a big family with the number of kids ever changing – but we definitely wanted to have more. We were surprised, frightened and excited when we discovered that we were expecting twins. Identical boys – Teddy and Davis. Bringing the twins home to a house with a three year old and not quite five year old was probably the most daunting task of my life. But as always we settled into a routine that worked. With so many children running around there was no chance of just one of us raising the children – it was all hands on deck. If someone offered to help out I never said no. Bill has always been a great dad and involved in the kids lives. Its truly been a partnership raising our kids. We have had several adventures in Italy over the years. After Bill’s first year at law school he signed up for summer school in Florence. We had a little apartment on the other side of the Arno. Bill would take the bus to Fiesole to study American Constitutional Law in the mornings and Austin and I would explore Florence. Visiting the parks and public pool, shopping and eating a lot of Gelato. Bill would finish class and we would leave Austin home with my cousing who was traveling with us and Bill and I would go out discovering Florence. Over the three months there we met several Italian friends who we are still in touch with today. Bill proudly graduated Law school with Lindsey on his shoulder a proud father and JD. When the twins were turning 5 we took all four children to Italy. We were in the Cinque Terre and took cooking classes with a local Chef who was fabulous. It was the early stages of the internet and he was a big early believer. He promoted his courses with great success online and wanted to set up a small company where he could provide extra virgin olive oil, traditional balsamic vinegar and coffee to his clients in the states. Always looking for a challenge – we immediately agreed to work with him and went through the process of figuring out how to import food products from Italy. When this hobby turned into more of a full time responsibility we had the option to shut down or go all in with a bricks and mortar store. Never one to walk away from a challenge we set our sights high and joined forces with good friends to open up Bella Italia in Bethesda. Now we were really learning how to import products from Italy. Our trips to Italy became more focused and we travelled throughout Italy finding new products and meeting new families who were passionate about their craft. Eating, drinking, and shopping became my full time job. The more we travelled the more people we met and the more we became rooted in Umbria. Several of the artists we were doing business with had become part of our family. All trips to Italy had a stop in Umbria. When we decided to buy a home in Italy – there was no doubt that we would buy in Umbria. And as a result our Italian family has expanded. Zia Augusta joined us for Teddy’s graduation, our oldest son Simone calls me Mommy, and of course we practically kidnapped Jennifer and her two children last spring when we were short in the kitchen. 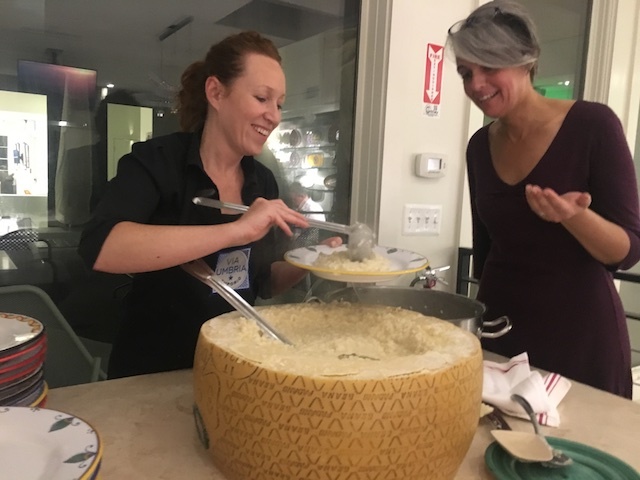 When we visit in Italy we have friends and neighbors (our family) who will drop by with a piece of cheese they saw at the market and wanted to make sure we had an opportunity to try or stop by for a drink and stay for dinner. 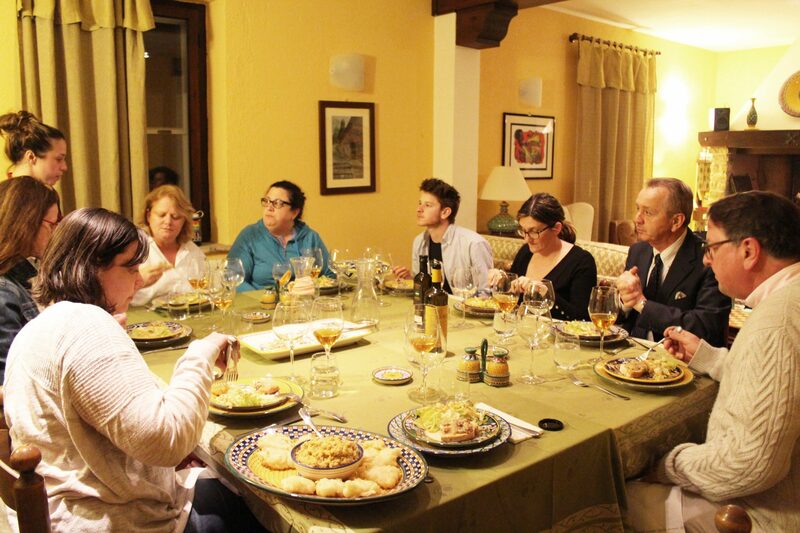 Our summer dinner parties in Italy are a blast – often introducing our Italian neighbors to each other. Their talents, their commitment to their art, their promise to continuing tradition is inspiring and makes us return to DC wanting to shout from the rooftops – come and see what these amazing people have done. I am fortunate to have met my partner in life at a young age. Hard to believe it will be 32 years in December. Raising four kids together was a challenge – running a business 24/7 is an even bigger challenge! Only possible remembering at the end of the day we love each other and we love what we do. Anyone who knows me knows that I use a lot of inappropriate words. The only word to me that is truly inappropriate is NO. When we began the buildout of Via Umbria our vision was confusing to others. Contractors and Architects are used to cookie cutter projects – is it a Restaurant? Is it a Market? Is it a Cafe? Can you sell wine? By design we are a bit of everything – an Italian Village under one roof. It truly is the reflection of all of our many amazing experiences in Italy and a tribute to the incredible artisans, chefs, winemakers, and people we have met there. It took a lot of patience and a lot of guidance to create the feel that we wanted. And then came the permitting – DC is definitely used to cookie cutter projects and there is no permit for “Italian Village under one roof”. But we knew what we wanted to create and weren’t willing to give up until we found the permits that we needed. Now the task of building a team to work with us who shared our vision. Finding a team who believe in what we are doing is no easy task. But over time and with a lot of on the spot learning we have created our Italian home in Georgetown. Going from Bethesda with a staff of 4-5 to Georgetown with a staff of 40 was a challenge. Walking into the store today puts a smile on my face – I am greeted with a Buongiorno and I see people taking care of people. I love the people I work with. Via Umbria is a family business. Our kids are all involved in some way. The boys clock in when they are in town visiting and they spent two weeks this summer travelling around Italy with Bill meeting old friends and discovering new producers. Our daughter Lindsey works with us full time. Who better to look out for the store than family? Lindsey grew up visiting Italy, she knows the families and she definitely knows the products. She is my daughter and my best friend. She is the perfect sounding board. She is my fashion consultant and my voice of reason. She is a talented young woman and I feel blessed to have her running the business alongside us. And what they do is spectacular. Over the last couple of years Giampaolo has expanded his cantina into a show stopping beauty. With high ceilings and miles of space to store his wine, a tour of the cantina is endless. And his wines are fantastic. We arrive for lunch on a beautiful spring day straight out of central casting. The sun is shining high in the sky, a gentle breeze is blowing across the terrace and there is a beautiful, clear view. I arrive a few minutes behind the group and everyone is animatedly talking on the terrace – drinking one of Giampaolo’s collection of sparkling wines. Today’s lunch is not about showcasing Tabarrini wines – he knows we are all big fans already. Today we are dipping into his private cellar and drinking wines that he has been given or collected over the years. We start with a beautiful Sicilian wine – only 10,000 bottles are produced each year. This one has been aging in the cellar and is extraordinary… Daniele and Teddy pop into the cellar and return with a big Primitivo from Puglia. A friend of Giampaolo’s makes this wine and it holds up perfectly with the beautiful guinea fowl we are eating. Our visit to the winery today is also a reunion. 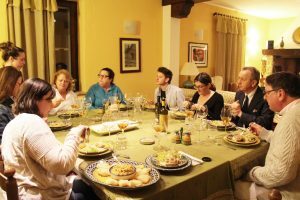 Giampaolo’s mother Franca had made her first trip to the US in December and spent two days with us at Via Umbria cooking amazing dinners to serve with the Tabarrini wine. Franca comes out of the kitchen to say hello and to kindly let us know that whenever we are ready – her bags are packed. So we enjoy a beautiful lunch and as we are leaving we pause on the steps to sit for just a minute to enjoy the day and of course more wine is poured and Giampaolo decides that his work in the field is done for the day. We don’t need a facebook memory for this day – the fresh air, the laughter and wine all bring back memories of people and place – of a day enjoyed two years ago that perfectly mirrors today. Two hours later we say our good byes and leave. But it’s not really good-bye because we are meeting up on Saturday in Verona to taste wine and enjoy another meal together. Don’t mention it – this is what we do.